This book was published in 1991 by Thames & Hudson Ltd. of London. 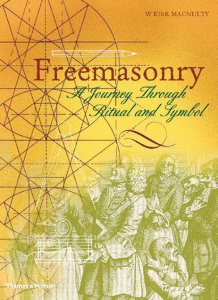 It is written by a Mason who takes great pains to describe three introductory degrees of Masons are and a myriad of other stages, symbols, and philosophies. Freemasonry is a psychology of what they call “mysteries” but insist that they are not “secret.” Claiming to be of ancient origin it does parallel many ancient cults including Gnosticism in many ways, especially in a continual upward search for meaning in life. The Masons use the symbols of their “craft” i.e. chisel, hammer, and ruler for first degree; the square, level, and plumb-rule for second degree; and pencil, skirrett, and compass for third degree, and many more, all of which have special meaning to them. There is no “salvation” in it other than self-help humanism and psychology. Any god can be worshiped along with their psychology and any religion practiced in conjunction with it. Seven levels of consciousness are navigated until Masons find inner peace with themselves and the deity which is within them. They believe that structures from Solomon’s temple to the cathedrals of Europe and even the American dollar bill, all were planned and orchestrated by Masons, or those who believed what Masons now believe. Though it claims the Bible as one of their “Three Great Lights,” (along with the square and compass) MacNulty writes, “In Christian countries the Volume of Sacred Law is usually taken to be the Bible, but as one travels East it is not uncommon to find Lodges displaying the Koran, the Torah, the Vedas, The Zend-Avesta, or some other scripture which reflects the religious persuasion of the Brethren composing the Lodge” (p. 17). Masons are encouraged to “pursue their respective religions with diligence. . . The nature of a Mason’s God, the Scripture he uses, and the form of his worship are not of concern to the Craft” (p. 16). Christ and redemption were not mentioned in this book.